It's Amelia's first Christmas and although we won't be buying her any presents ( ok we might have bought her this cute penguin dressing gown but thats it! ) She is only 3 weeks old and she got alot of new clothes and gifts when she was born so she doesn't really need anything. Clint's mom has also gone crazy and bought her loads so she really doesn't need anything else. 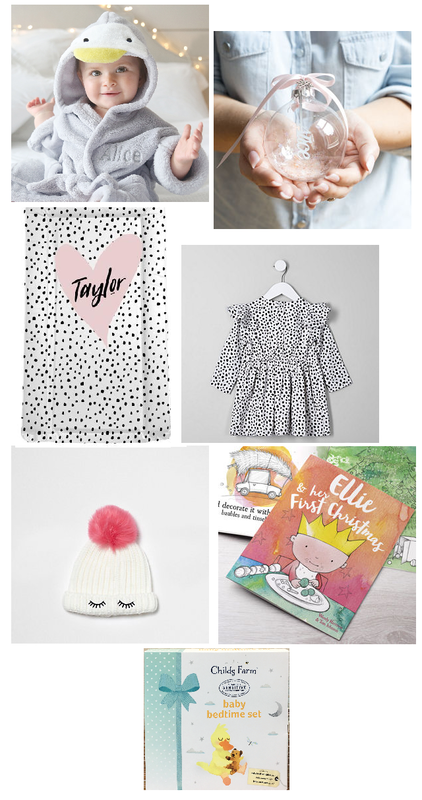 I thought it would be nice to put together a little gift guide of some products you could buy for your baby or maybe one of your friends has recently had a baby and you need some inspiration. First up is this cuteeee penguin dressing gown from My 1st Years, as I mentioned above we've actually bought this for Amelia because I love penguins, it's on offer right now aswell. You can have it personalised so it would make a really lovely gift, if you don't fancy the penguin they also do standard personalised dressing gown or they also have some other festive designs. I think a personalised bauble is a lovely gift idea, this gorgeous glass bauble is from Studio Seed via Notonthehighstreet.com. It's a nice keepsake that will get to go on the Christmas Tree year after year and then when their older they might even hang it on their own tree. I have featured this mat from Mamashack before. I've actually bought one for Amelia already and we love it. We've had so many compliments on it and they have lots of other patterns. They also sell lots of other personalised products so make sure you head on over and have a look. 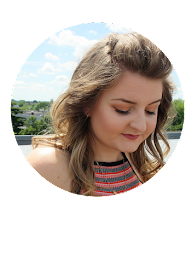 I always love buying clothes for little ones, River Island have lots of gorgeous clothes to choose from. How cute is this dress, I love the print and think the design is really nice. I think i'm going to get this for Amelia for when shes a little bit bigger. This hat is also from River Island, all of Amelia's hats are still too big for her little head. I love the pink pom pom and eyelash design, it's so cute. These Childs Farm gift sets would make a lovely gift for a new baby, they contain lots of goodies perfect for a newborn. It's a good way to try some new products. Childs Farm has been developed especially for baby's delicate skin, even sensitive and eczema prone skin. I have bought Amelia some books, I picked up some off the works website, they have an offer where you can get 10 books for £10 so I think they would be lovely gifts for Christmas. This personalised book is from Letterfest via Notonthehighstreet.com again this is a lovely gift and would make a keepsake. So many lovely ideas here! I think having a personalised bauble for a baby's first Christmas is such a wonderful thing. I bought one for my little boy & started a tradition of getting him a bauble each year so he has his own little collection when he's older! The Works offer is so good isn't it? I've used it quite a few times to build up Arthur's book collection & they have some really lovely stories available.